True to the motto " Dough-how & more", we present, new technology and innovative processes in hall 3, booth D17. These cover the production of premium bakery products such as croissants, pastries and pizza, with a focus on bread and rolls. This focus is on new solutions for the highly flexible industrial production of long-moulded bread in addition to round-moulded rolls. 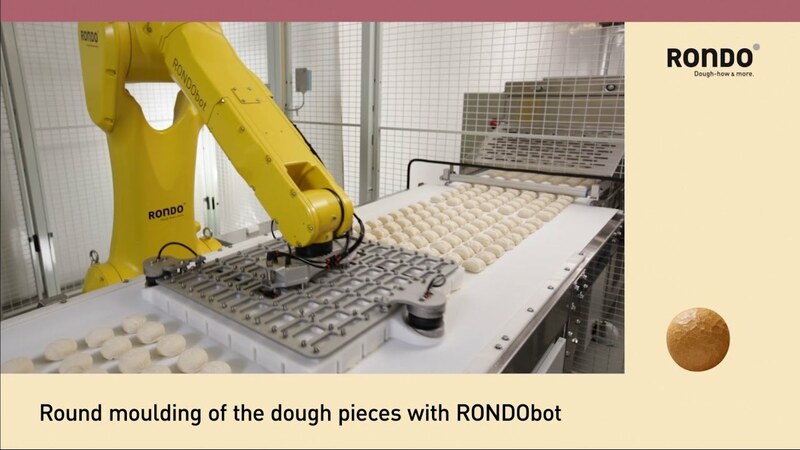 Another important feature on the RONDO booth is the introduction of Industry 4.0, leading-edge technology, which is becoming increasingly important in the bakery industry and for which RONDO has solutions today. Production of artisanal style bread and roll products from a dough band is currently experiencing rapid growth. This method of production being the only way to ensure gentle handling of highly hydrated doughs. At the front of such a RONDO bread line is the MIDOS industrial dough band former, designed for a maximum dough throughput of 10 tons per hour. MIDOS processes all types of dough and produces a homogeneous dough band with uniform thickness and width, thus laying the basis for the production of bread and rolls with precise weight accuracy. In contrast to other systems, MIDOS can process dough with high water content and long proofing time without the use of dusting flour and/or process oil. Due to the special configuration of the rollers, MIDOS is able to influence and control the pore structure of the dough. The dough band is then gently brought to the final width and thickness on a subsequent make-up line, before being cut into dough pieces. Depending on the type of bread or rolls required, these precisely dimensioned dough pieces can be then long or round-moulded. We exhibit two trend-setting systems at Interpack; the Industrial Long Moulding System for the production of long-moulded bread loaves and RONDObot for the production of round-moulded rolls. Such an industrial bread line can be equipped or supplemented modularly according to customer requirements. It is characterised by modern hygienic design in which all parts and components can be easily accessed and cleaned. Like all our industrial lines in ASTec design, it is also available in a version which can be wet cleaned with high pressure washing equipment. We present a powerful solution for industry 4.0. at Interpack - RONDOnet, With this system, line conditions and interactions are recorded, documented and analysed. RONDOnet features condition monitoring and thus the detection of fault conditions before a component fails. In this way, RONDOnet efficiently supports production management in the optimisation of line performance as well as in minimising downtime. RONDOnet can be used as a stationary application directly on the line control panel or in a central control room, it is also available for mobile devices such as mobile phones and tablets. For the industrial production of today's trend products such as gluten-free, Frozen to Oven-Croissants, Long Shelf-life or Clean Label pastries, an integral view of product, recipe, processes and plant engineering is necessary. With Dough-how & more, we feature the broad knowledge and years of experience to develop together with customer’s new products and production processes. Our Dough-how Centers in Burgdorf (CH), Schio (I) and New Jersey (USA) are available for this purpose. At Interpack, you can find out more about our Dough-how Services. As always, the combined expertise of the whole team of RONDO Industrial Solutions will be welcoming visitors to RONDO booth D17 in hall 3. Together with our unique Dough-how specialists, they are fully at your disposal for all questions concerning industrial production processes and production equipment for baked products. RONDObot combines high performance with unique flexibility.